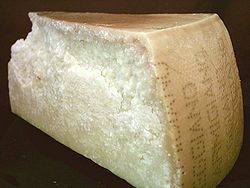 Parmesan cheese is a hard dry white Italian cheese that stores well. It has a particularly buttery, salty taste. It is also known as Parmigiano-Reggiano. It is available ready-grated as a powder intended for sprinkling onto food at the table. Grating or shaving the cheese into thin slivers immediately before use will give a moister result. Parmesan is the traditional topping to many Italian dishes, including risotto, where it adds a final richness and creaminess. With the advent of refrigeration and pre-shredded soft cheeses, mozzarella cheese can now take the place of parmesan for table usage but the taste is blander. Parmesan cheese is used in the making of pesto. This page was last edited on 23 December 2007, at 00:08.